Our editors recently discovered two Instagram accounts that publish the craziest looks of subway/underground riders in Moscow and St. Petersburg. We decided to put together a selection of photos from these blogs in a quiz format and let you vote for the winner in each category. Category: best hair-do. Don’t have thick golden locks of hair? No problem! Our nominees, Rapunzel and Freddy Mercury, were able to make it to the top spots thanks to their wonderful wigs. Category: best make-up. Ladies know that they can easily hide their little imperfections with the help of well-applied make-up. They can even tweak those imperfections to their advantage to the point that no one can peel their eyes away from them. Whose make up is better? Category: best accessory. Any outfit can start looking new if you choose the right accessories to go with it. A backpack in the shape of a satanic Teletubby, for example, shows off its owner's cheerful demeanor and distinguishes him or her from the crowd. Which accessory helps not to vanish in the crowd? Which catwoman is more dangerous? Category: I live life in beauty and luxury. 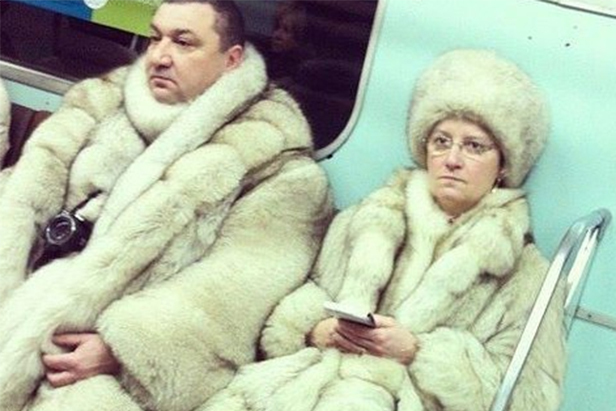 Russians love fur coats. Russians love Louis Vuitton. But the popular phrase on the Russian Internet, "Feels like Louis Vuitton. Go real or go home," doesn't seem to apply here. Category: look of the year. The main thing is practicality. Women complain that they spend the whole day in high heels...add sneakers to the mix and problem solved! The second nominee was able to combine the latest trends: sporty chic plus original headgear—to blow the competition away. Who is the queen of subway style?